Share the post "Struttin’ Daddy"
With a day filled with oddities along with our frigid temperatures, I’ve decided I’m becoming all the more not in “like” with temperatures hovering around zero. Since I had some time to kill before my open house, I decided to continue on cleaning on a stove which a tenant believed was acceptable upon moving out. Oh Mercy! The burner grates were so sticky from burned on grease, I placed them in a plastic tub yesterday with an extra helping of TSP and left them to soak for a good 24 hours. When I went back to the tub to start cleaning them, I had to quickly dump the water because it smelled too much like something coming out of a sewer. I’m proud to say after two hours, those burner grates are completely cleaned and ready to be placed back on the just like new stove that was there before the tenant moved some ten years ago. There’s one question in my mind why so many people have health problems due to their not keeping their kitchens clean and tidy. I was appalled by the amount of rancid grease build-up. Again I blame the parents of most who haven’t got a clue about keeping their homes clean and tidy. I’ll likely have a bit of a charged conversation with the newspaper come Monday morning. The picture of the public open house I hosted last Saturday was wrong, and today, the picture was wrong again. It’s no wonder I had so few visitors last week as well as today. The idea of “to err is human” only goes so far as once in a while, but not for two weeks in a row. As I’ve considered, if someone makes the same mistake twice in a row, then the mistake becomes chronic until it gets corrected. My favorite German saying has always been, “Wer nichts tut, macht keinen Fehler.”, which loosely translates as, “He how does nothing, makes no mistakes.” I’ve reminded of few over the years of this whenever there’ve been people who’ve considered themselves above fault. While rummaging thru some papers in a rarely opened drawer at my office this morning, I happened across a copy of a postcard I made a copy of at least 20 years ago from a box of old papers belonging to a client’s estate. Since I’ve considered myself exceptionally soulful whenever around things belonging to others, I’d decided from the time I became a Realtor that one never takes anything belonging to others whether alive or dead. I remember when I found it and having read it, how resolute the writer was in breaking off a relationship she likely had with a man who certainly didn’t live up to her standards. It had been so long since I’d read what she said that I was again having a jaw-drop in reading her words from likely a hundred years ago. 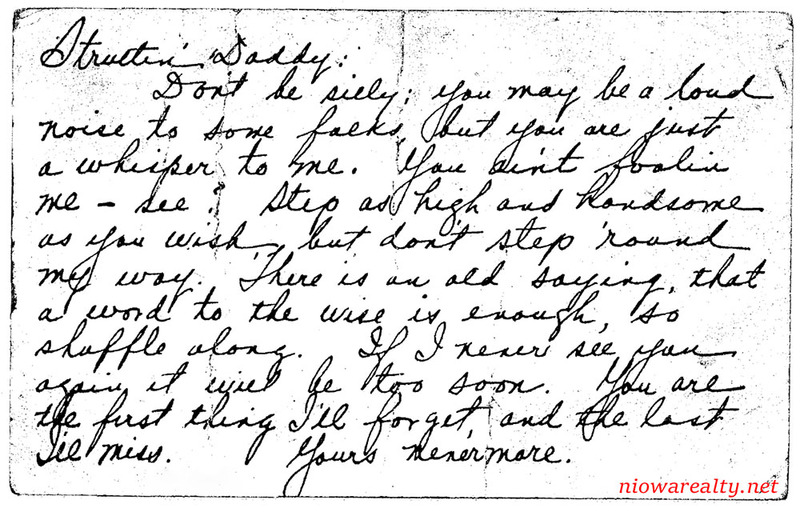 When today looking at her cursive handwriting, she’d likely been in her prime somewhere around 1900 – 1920. Since the postcard I speak about was in a box of papers 20 some years ago, and it was from an estate even years before, likely all family members involved are currently taking their long sleeps. I only wish that I’d taken the time to look at the front side of that postcard and see to whom it was addressed, as well where it was mailed here in our City. Yes, it was another missed opportunity of connecting the dots with our past history. I hope you all can read the very old cursive handwriting in what I’ve posted above as well as notice how our language has evolved over likely one hundred years.